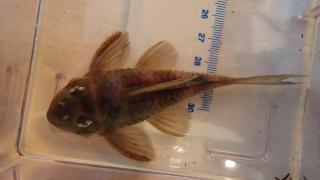 The trend in exotic l-numbers draws from suckermouth catfish with bright colours and high contrast patterning; it has redefined the catfish keeper from someone limited to keeping less than colourful and secretive fish to someone who has a new palette of flashy fish to consider. Chief amongst this new wave of plecos are members of the genus Hypancistrus. 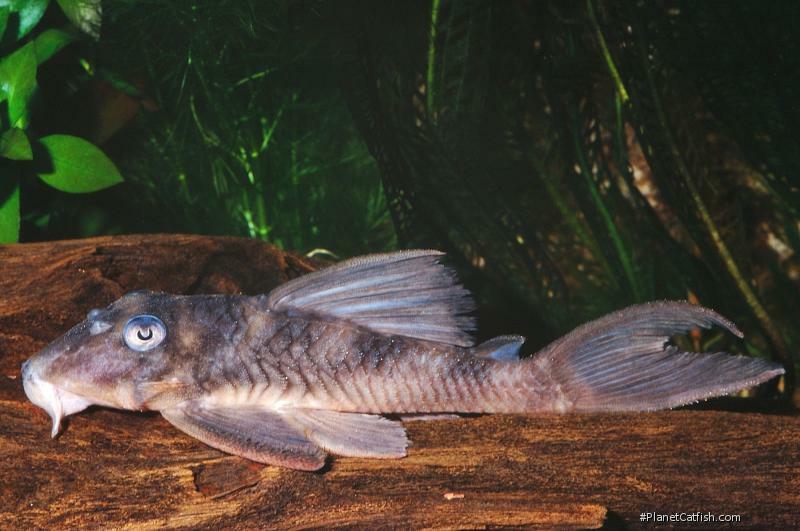 The hard-core catfish fan will therefore delight in the irony and appreciate the appeal of the most drab of such plecos. Dutch aquarist Jacqueline Bennett-Leaver explains. This otherwise typical Hypancistrus species is one you have to learn to appreciate. You either hate it or love it. Of all the beautifully coloured, striped or dotted Hypancistrus species we've got, this must be the most stark one of all. Its basic colour is, no matter how you dress it up, basically different shades of grey. Unless, under duress, they do display the typical stress pattern of light and darker coloured bands across the body. 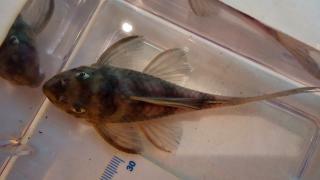 On the tips of their dorsal and tail fins they have small white tips. It gets it's name Zombie as it looks a bit, well, dead. However, I think they are one of the more elegant Hypancistrus species, having a beautiful high dorsal fin and nicely forked tail. I have found that Zombie plecos are quite relaxed about making an appearance in daylight. That makes them good company for those who would like to see them once in a while. Females will lie under some wood or slate, males will tend to stick to their caves. When feeding time comes, they will be the first to show themselves for you to enjoy! That is also the time they will get a bit aggressive towards each other, chasing around the tank. So it is best to give them a slightly larger tank to provide enough hiding space to keep peace among the fish. They will eat anything from tablets to frozen foods; I also give mine spirulina tablets to ensure the health of their gut. I was given an opportunity to buy some young adult L070s, and select my group out of several individuals. They were not in breeding condition so sexing them was difficult. I chose four definite males, two sure-fire females and two unknown but smaller fish. They turned out to be 4:4, so that made my day! After quarantine for two weeks I put them into my breeding rack. This is a circular system of nine tanks and one large biological filter, together good for about 2200L of water. This also contains a nitrate filter of 10L. They started spawning just two days after introduction! After the first spawn I noticed the fish were getting a bit more aggressive towards each other, later I had to remove two males out of the breeding group. Then I put the rest in a larger tank to provide for more space and also added more wood. The breeding tank contains six caves, one for each fish but only the males use the caves. They started spawning again quite quickly after the move but the first time the eggs were eaten after two days. The third time went much better and resulted in a large amount of healthy fry. It did surprise me that this species took two days longer for the eggs to hatch then I was used to with my other Hypancistrus, all being kept in the same water and system. The eggs have a light pale colour, as compared with H. zebra eggs, and are larger. The spawns contained about 15-20 eggs each time. The fry are a unusual story. 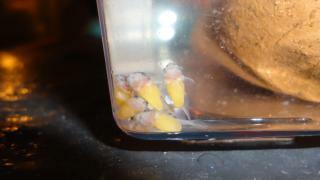 They have an enormous growth rate, of which I have never seen before with Hypancistrus. As I leave all fry in the breeding tank with the group they aren't stressed by catching and moving of tanks. 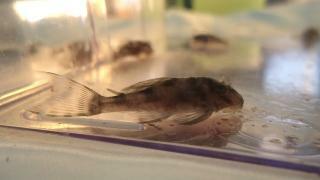 The fry consume their yolk sacks within five to six days but stay mostly in the cave up till 10-12 days. When they come out and start to forage around the tank they grow quickly. But note that it is necessary to feed the fry extra with powdered foods as they can not compete with the adult fish in the tank and starve quite easily. I had to learn that the hard way and unfortunately lost some fry in the beginning. 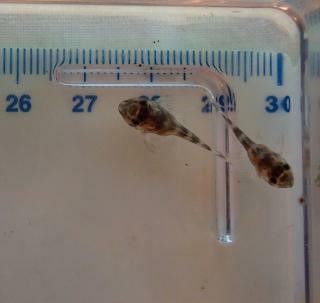 After two weeks the fry reach 2cm, and then reaching 4cm in just 13 to 15 weeks! I was truly amazed. Coloration of the fry is also interesting as they have clear light and darker coloured bands across their bodies during the first weeks. This disappears after 12 weeks or so, turning to evenly coloured grey like the adults. This is clearly not the most attractive member of the genus, but it's a great catfish and very rewarding to keep and spawn. Identification Different shades of grey are displayed, the intensity will depend of the substrate color and the mood of the fish. Feeding Omnivorous with a tendency towards meaty foods. Not an effective algae eater. Well fed individuals will not damage most plants. They will also accept commercially prepared food such as Spirulina tabs. Breeding Has been bred in captivity, male guards eggs in cave as per usual for the genus. 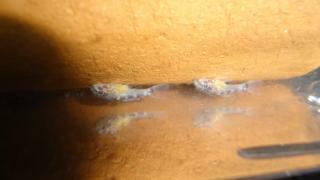 Eggs are around 4mm, around 30 eggs. One spawning report gives a pH of 7.4, GH around 8, and temp 29°C.